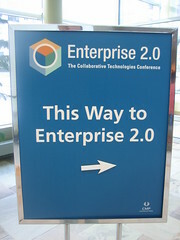 In true 2.0 form, the conference organizers for the Enterprise 2.0 track team have been collaborating around the world, assembling an A-list of early adopters on Enterprise 2.0, evangelists, and visionary entrepreneurs. Using Skype, IM, wikis, and the occasional email, we have been able to bring together a terrific team of speakers from three continents. Ismael will be posting the agenda sometime in the next 24 hours, and some of the invited speakers are not yet confirmed, but I wanted to start getting the word out about what we have going on on our side of the house (there is a mobility track running concurrently with the Enterprise 2.0 track). Like Andy McAfee says, “It’s not (just) the technology.” Culture, culture, culture is the new barometer for success with Enterprise 2.0. But cultural changes can be painful especially within a large enterprise. Some argue they are too disruptive to be effective and that hierarchical systems work for a reason. We put together an expert panel on Culture in the Enterprise to discuss these larger issues. Similarly, we will have a Customer Panel who will share real war stories from the trenches. From investment banks to pharmaceuticals to manufacturers, hear first hand from evangelists and practitioners what’s working and what’s not. Day Two begins with a presentation by Adam Carson who has been on a mission to bring Enterprise 2.0 to Morgan Stanley. Adam’s story took some interesting twists and turns this year. Everyone will find something they can relate to in Adam’s presentation. Then, coming from half-way around the world will be Stephen Collins who has done some of the best slideshare presentations I’ve seen on Enterprise 2.0 this year. Steve will present “Knowledge Worker 2.0.” Who is the KW2.0? It’s you. This year’s new collaboration tool is mindmapping. We included a session on the power of visual collaboration. This panel will explain this powerful new collaborative tool and how to employ it within the enterprise. Finally, still pending confirmation, we hope to have Dion Hinchcliffe give us a wrap-up of the state-of-the-market in Enterprise 2.0 and then lead a panel on company-sponsored user communities such as SAP’s Software Developer Network (SDN). Other user communities we are recruiting include Sony, Webex, and Atlassian. If you have a large user community and would like to be on this panel, please let us know. These sessions may change as we near the conference date, but this is what we have planned thus far. Keep checking the Office 2.0 site for Ismael’s posting of the conference track agenda. Plaxo? Well, well, well. An old friend suddenly turns heads. So, I’ve been using Plaxo for a long time now. Probably years? I dunno. When did they launch? I seem to remember always having my contacts online with Plaxo in recent years. It’s always been handly to have an online database of my contacts. Plus, I really like the user-generated, self-maintenance of my personal contact database. Makes life really easy for people who never getting around to digital housekeeping. I guess LinkedIn is the same idea, but Plaxo has always been a nice convenience for me, but something I would have filed in the “personal productivity” category of life’s niceties. Kind of like a Swiffer or my Polaris. But, all that is changing. Little Plaxo may be the engine that just could give Facebook a run for its market dominance. I know I’m not the only one who thinks so. I saw this piece on Wired today, “Slap in the Facebook: It’s Time for Social Networks to Open up.” It was also picked up by Tom Regan, an NPR blogger, here. And I’ve already blogged about the impression Plaxo made out at mashup camp with its 3.0 release demo. And try as hard as I might to convince others that Facebook really is for business, “REALLY GUYS!”, screen shots emailed around the company like this don’t help my case much. So, I have to concede that, yes, Facebook still has a way to go before we can allow it into the realm of real corporate power, quiet dignity, and serious prestige that comes with the territory of selling to the F500. So, Plaxo, which did not start its business plan in a college dorm room majoring in party photos, approached the social networking exercise the way business people actually are networking. Basically in three large buckets: Business, Friends (real friends), and Family. Perfect. Taking a page out of David Weinberger’s, “Everything is Miscellaneous” perhaps, we all can probably sort everyone we know into those three categories if we had to and add some to both or all three depending on how relationships change in our lives over time. Plaxo starts with the whole “mess” (in Weinberger’s terms), and we customize the sort from what we have already– if you’re already a Plaxo user, that is. I guess it’s even easier if you’re not a Plaxo user, you can start fresh. Look how easy they make it to connect to your “friends.” In this case, I’m sending an invite to Craig Cmehil who is already in my Plaxo network. Once I connect to Craig as a Business contact, I can isolate his feeds (blog posts, videos, twitter posts, delicious posts, and whatever else Craig is doing online that he cares to share with me and others) to my business network. Now, we are getting closer to a practical social networking tool for the Enterprise. Although, admittedly, it will be difficult to break the Facebook addiction. Try the new Pulse on Plaxo. I’m curious what the reaction is going to be. I was helping my son study this morning for his 5th grade test on the American revolution. (I always feel like I have to apologize to my British friends when I write about our country’s rebellious beginnings.) Nonetheless, one of the questions on his study guide was, “Who was Swamp Fox?” I laughed and immediately thought of Maggie Fox, who is not an American, but a Canadian who has been Twittering from the Mesh conference there– giving us a play-by-play of what the highlights are from the day’s speakers. She’s been doing that for two days. It’s rebels like Maggie who are using social media tools like her weekly podcast and now Twitter to keep us informed and engaged, as we sometimes get battle fatigue out here beating the drum for Enterprise 2.0 revolution and Social media salvation. According to Wikipedia, “Swamp Fox” became famous for “his ability to use decoy and ambush tactics to disrupt enemy communications, capture supplies, and free prisoners.” This movement has its unsung heroes too– like Maggie, tirelessly, thanklessly, Twit-casting away at Mesh. She may just end up with a Wikipedia entry of her own. Some housekeeping notes: I’ve been getting a barrage of spam for some reason that Akismet is not catching. It’s been really annoying, so I had to adjust the commenting form for the blog. You’ll have to sign in now with your email address. I hope that solves the problem. Also, on the BSG Next Generation Enterprise Daily blog, I posted today about the long overdue face-off we are putting together with Andrew McAfee and Tom Davenport. Because it’s a BSG-related event, I’ll be writing about it over there. During the 90s, when I was tracking the IT services market, there was a continuous blurring of roles and activity between Management Consulting firms, Strategy firms, and good ole’ IT services firms. IBM had IBM Consulting, CSC had CSC Index, EDS bought A.T. Kearney— throw in a few strong boutiques, and they all competed against McKinsey, Booz Allen and Bain. It got really wild during the dotcom run-up toward the late 90s, as web 1.0 approached because a lot of these guys left the security of these large firms to run start-ups. Looking back, there was one reason these guys made good candidates to run web startups– they spoke the CEO’s language. They could persuade and convince a board room to make a “bet your business” proposition. Now luckily, not a lot of F500 CEOs made decisions they couldn’t undo based on dotcom disasters, and most of the well-healed consultants went back to their high billable rate profession after the bubble had burst. I’m writing about this today because I’ve participated recently in two events on adoption on Enterprise 2.0. One was a live event in NY which drew mostly a financial services audience and one was a webinar with approximately 50 callers participating. Today, I’m writing from my room at the Ritz-Carlton hotel in Naples, Florida (pictured left) where I’m about to attend a few social events with CEOs who are looking for answers about this new wave of Internet disruption or opportunity– as the case may be. I promised not to flack here about BSG, but we did make a terrific acquisition this week which gives us the privilege of bringing this story to the executive suite of some of the most well known brands in the world. You can read about goings on at BSG on a blog I’ve started here. I have to admit, frankly, the chance to evangelize on the next generation web to customers like American Airlines, British Telecom, Deutsche Bank, DaimlerChrysler, DuPont, ING Bank, Johnson & Johnson, Marriott, Merck, Pfizer, Rolls Royce, Royal Bank, and Shell gives me goosebumps– even in the hot Florida sun. Even though we speak a lot in the blogosphere about the user-generated, collaborative, self-service benefits of social media and enterprise 2.0 technologies– the radical, cultural, enterprise-wide transformation we’re looking for is going to have to come from the top of what are still hierarchical organizations. And for that discussion to begin, the best tool we have today, may be the same tool that has worked for decades– the golf ball. Posted in blogs, Enterprise 2.0, Enterprise Mashups, Interactive Agencies, Irregulars, Next Net, Office 2.0, RSS, SaaS, Social Media, Web 2.0, Web Integrators, Wikis | Comments Off on THIS changes everything— Now it gets interesting.